When I'm out and about in San Francisco, it's wonderful to see so many different personalities out there, all dressing distinctively. Sometimes the styles I see are note-worthy and inspirational, giving me ideas for different types of looks I should put together myself. By contrast, there are also some looks that I just can't get behind. As much as I love individuality and unique style, I think there are certain fashion faux-pas that just don't work well on anybody, regardless of color, stature, or body type. So here are some of them below- my style pet peeves. 1. Heavy designs on jean back pockets. 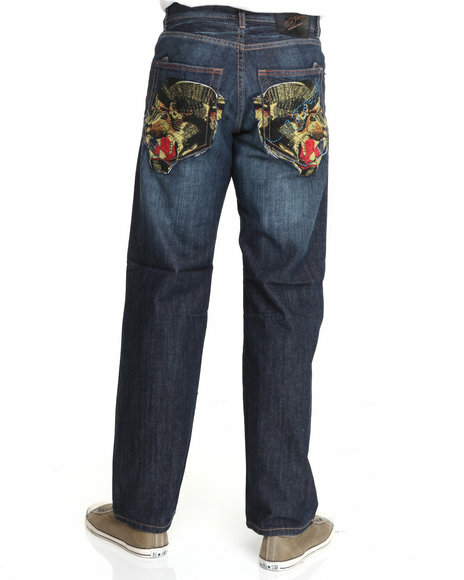 In college, I bought a pair of True Religion jeans with a horseshoe label on the back pockets. At first I felt all badass because I was in possession of a $200 pair of jeans (which I had gotten for $30!) while still under 21. Though the back pocket design wasn't as ridiculous as the Ed Hardy jeans above, I soon figured that it was a little more "detailed" than I would have preferred. I just didn't feel very comfortable putting a giant spotlight on my buttocks for all to check out. This mentality has stayed with me ever since, and now, I hardly purchase any jeans with more than a simple line on the back pockets. I would urge you to do the same; focus on fit, not on novelty designs. 2. Dress shirt collars hanging outside of sweaters. This particular look didn't used to bother me very much, but for some reason it now does. When wearing a dress shirt, I personally like to keep my collars tucked into the neck of the sweater because it just plain looks better. The collars stand upright, and there is more symmetry to your outfit. It's quite a simple fix for those of you who haven't been doing this. Just tuck, and you're good to go. 3. Dress belt & shoe color mismatch. Your dress belt and dress shoes should generally match (or complement) when you're wearing formal or semi-formal wear. This doesn't really apply as strictly when dealing with casual wear, but either way, I think stylish men often pay attention to belt-shoe coordination in any situation. Seeing someone wearing a light brown belt with black shoes really makes me want to go up to that person and personally take them to a store to buy a proper belt. When wearing black shoes, wear a black belt. When wearing brown shoes, wear a brown belt. Even if you can't get a perfect belt/shoe combination, try to match the two fairly closely. These used to be a go-to shoe for many business professionals 5-10 years ago. I don't really know why, but I do remember seeing square toed shoes on every other person that passed me on the street. If you're one of those people that still has these shoes laying around the closet, I suggest you donate them to a charity, because they're not aesthetically pleasing in the slightest. I've seen girls literally shudder at the sight of them, and dismiss perfectly fine looking gentlemen just because they were wearing these type of shoes. That, my friends, is not a good sign. So there you go- my menswear pet peeves. If you want to rock these looks, by all means... but just know that I might be secretly shaking my head.